What happens in our childhood is known to influence the choices we make in life. The TV programmes we watched when we were young were equally influential, especially in the development of the kinds of novels authors write. For some it is just the same kind of thing as they watched, not being able to get enough of their chosen genre, for others it might be producing a parody. Sometimes they get published. One of the programmes I watched was the Man From U.N.C.L.E. So did Charles Stross. That has been a profound influence on his series known as The Laundry Files. In the TV series, the secret organisation HQ was accessed through a laundry, in Stross’s books a secret organisation is based above a Chinese laundry (at least it was at the beginning). While the former dealt with counter-espionage the latter counters unlawful use of magic and this is London rather than New York. The first person narrator is Bob Howard and IT specialist because it is now understood that magic is a function of applied mathematics. From the outset of The Rhesus Chart Bob keeps being told, vampires don’t exist along with the very logical reasons such as there would be a lot of them around if it was true and the human population wouldn’t be able to satisfy the needs of all of them. With a statement like this in the first line, it is obvious that Bob is going to find that a very untrue statement, even if no-one believes him. Vampires in this reality aren’t produced from being bitten by another vampire; they are the result of the dimensions being breached by complex computer graphics. To add irony to situation, the group that stumble upon this are a secretive cell within an investment bank, so the blood-suckers become bloodsuckers. Bob only discovers their presence by stumbling on a clutch of deaths which show the post-mortem damage of v-CJD but without the presence of prions or usual gradual deterioration. Despite still being told that vampires do not exist in the face of actual ones, he becomes convinced that there is one within the organisation and who is using a hex to remain concealed. As might be expected, the progress of the plot is not straight-forward. People are being manipulated. Bob has some immunity to the vampires’ power of mind control as he is the apprentice to Angleton, the Eater of Souls. There is plenty of clever and imaginative plotting here but the barrier to complete enjoyment is the style. This series is billed as the Laundry Files. Files and the reports they have in them tend to be dry, sticking only to the facts. That doesn’t make for exciting reading. On one hand, the narrative here is presented as that. It is Bob Howard’s first person account of the events leading up to the final denouement. This means that there passages that are dry and stilted where expositions are given but since this is an internal file, not intended for the public eye, then some of the explanations would be superfluous as the reader will already be aware if the information. This approach also presents a problem for those, crucial, segments when Bob is not actually present. They are treated as ‘another point of view’ within his narrative. There are other literary techniques available. Most of the novel reads as a good, action thriller and is constantly straining to escape the constraints of the report format. Stross should have let it go. There are many fans of the Laundry Files. 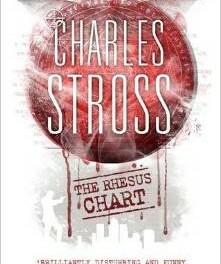 Apparently, there are some who have express anger at the way Stross has treated some of his characters in the closing chapters of The Rhesus Chart. Why? In any novel, film or TV programme where the characters are daily facing extremely hazardous situations it is only reasonable to expect some collateral damage. To have all your main characters reach the last full stop unscathed goes against the realism a good writer is trying to convey. In life, tragedies happen and not just to people you vaguely know. 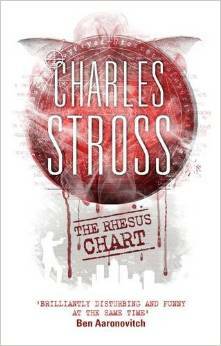 It is good that Stross has the courage to treat his characters the way he has. Yes, it will be upsetting if you have come to care for them and the fact that readers are unsettled is a sign that Stross is achieving what he set out to do.